This set is designed to make learning centers easy to make! 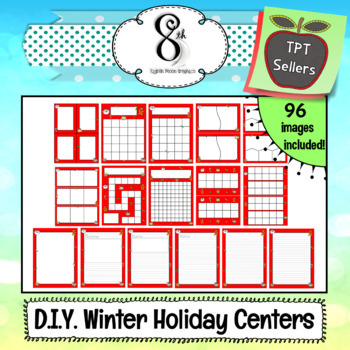 There are 6 different Winter Holiday backgrounds with 16 learning center templates, for a total of 96 images. 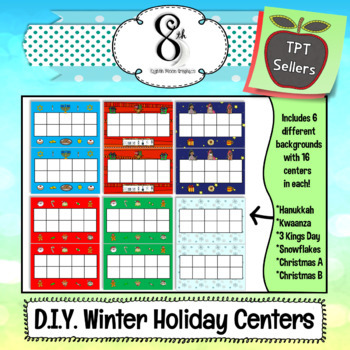 Backgrounds are winter holiday themed and include: Hanukkah, Kwaanza, Three Kings Day (El Día de los Reyes), 2 Christmas sets in green and red, and Snowflakes. The centers include: flashcards or task cards, bingo, matching puzzles, sequencing, a board game, a 100s chart, ten frames, 20 frames, a blank page, and 5 different lined writing papers on different levels. This set is appropriate for all ages from preschool through high school. You may also like this Flashcard and Card Game Maker!